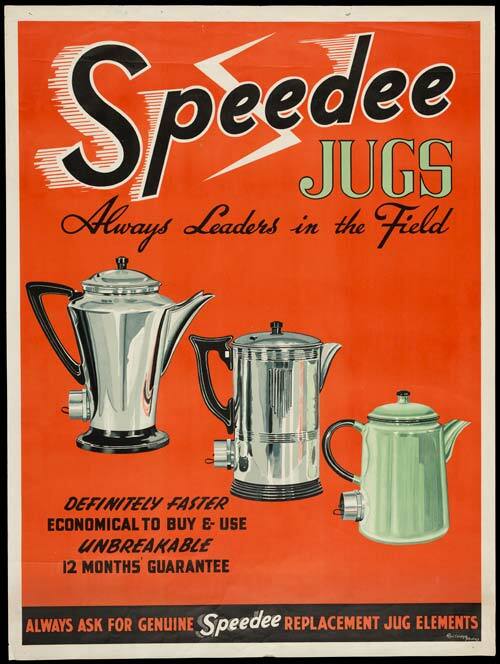 This New Zealand Railways poster from around 1950 advertises Speedee electrical jugs, made by the Christchurch firm H. C. Urlwin Ltd. The two jugs on the left are chromed copper. The one on the right is steel coated in pale green enamel, and was made under licence to Bulpitt & Son in Birmingham, UK. Bulpitt's brands included Swan electric elements and Judge enamelled cookware, and the enamelled jug bodies and lids were probably imported from the Judge plant. It seems that British customers preferred the kettle form, while New Zealanders accepted the jug.